PAT PILCHER takes Fitbit’s latest fitness tracker/smartwatch for a test run and discovers that smaller doesn’t mean less features. Fitbit has made big moves in the past 18 months, going from being a big fish in a shrinking fitness tracker pond to a smartwatch player whose sagacious chronographs are giving existing smartwatch players pause for thought. A case in point is their latest, the Fitbit Versa. It bares more than a passing resemblance to Apple’s popular iWatch and is more a smartwatch than fitness tracker. That said, it still packs plenty of fitness tracking chops. So, the big question is will its updated software, curvaceous design and performance make it an attractive enough proposition to take on other competing smart watches? Looks-wise, you’d be mistaken for thinking the Versa was an iProduct, at least until you get up close. 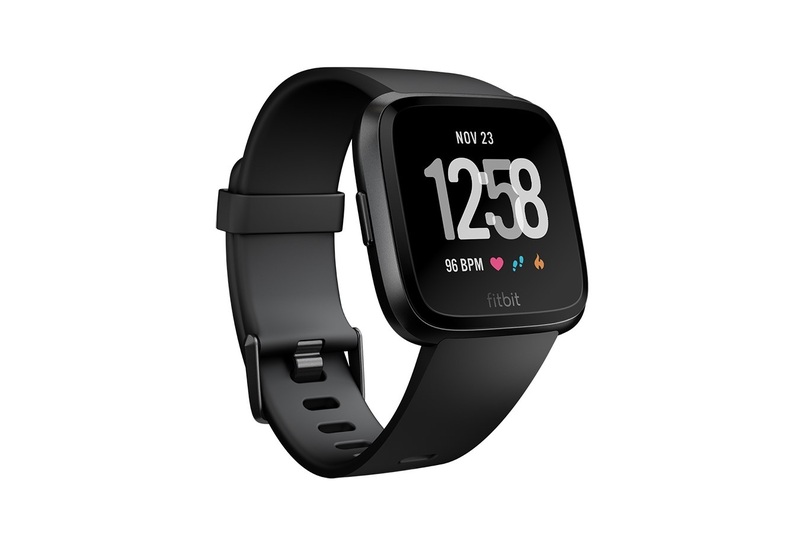 Where its predecessor, the Ionic, was definitely a masculine looking piece of hardware, Fitbit have designed the Versa, so it looks great on both male and female wrists, and its smaller and more rounded design makes for a comfy fit. As with the Fitbit Ionic, the Versa comes with two watch strap sizes – small and large – in the box. The straps are swappable for a comfier fit. Speaking of comfort, its 39.36mm × 37.65mm × 11.2mm size means it doesn’t catch on cufflinks, nor does it get in the way at the gym or make the wearer look as if they’re under house arrest. It’s also so light that I often forgot I was wearing it! The review device supplied featured a black body and strap straight from the Darth Vader school of design. 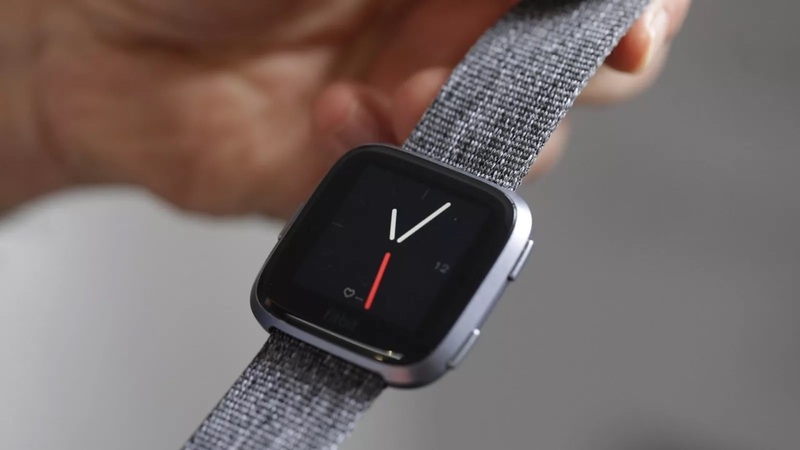 I liked its zen-like minimalism, and while the Versa’s silicon straps irritated my skin, they’re swappable for alloy or leather options from the Fitbit store. Straps aside, there are also hundreds of different watch faces available. Some are stats heavy while others are more discrete by not displaying your fitness stats for all to see. In use, the Versa is a doddle to drive. Tapping its screen or flicking your wrist wakes it up from standby to give you its default display. This can also be done by pressing the home button on its right-hand side. Swiping up on the Versa’s touch-screen pulls up your fitness and health stats, saving you from fossicking about with the Fitbit app on your phone. There are also tips and tricks plus motivational messages to keep you in pursuit of improved fitness (unfortunately I never saw one saying, “Go on – have another pint and grab us some more crisps, will you?”, but there you go). These can thankfully be turned off. As well as a step count, you can swipe left to find out how many flights of stairs you’ve climbed (far too many), calories burned, active minutes and so on. In addition to exercise stats, you can also check your heart rate/resting rate too. One stat missing off the Versa’s display is sleep tracking – a real shame as wearing the Versa when you head for the land of nod allows it to capture data on the quality and extent of your sleeping. It is understandable though, as most people on average sleep for about eight hours, and that’s far too much info to cram on the Versa’s tiny 1.34-inch screen. The one feature I was unable to test was the female health option. Female Versa wearers can manually log when their period occurs on the Fitbit app. This then allows the Versa to estimate the number of days until the next period, which day of their cycle they are on, and even optimum fertility days. 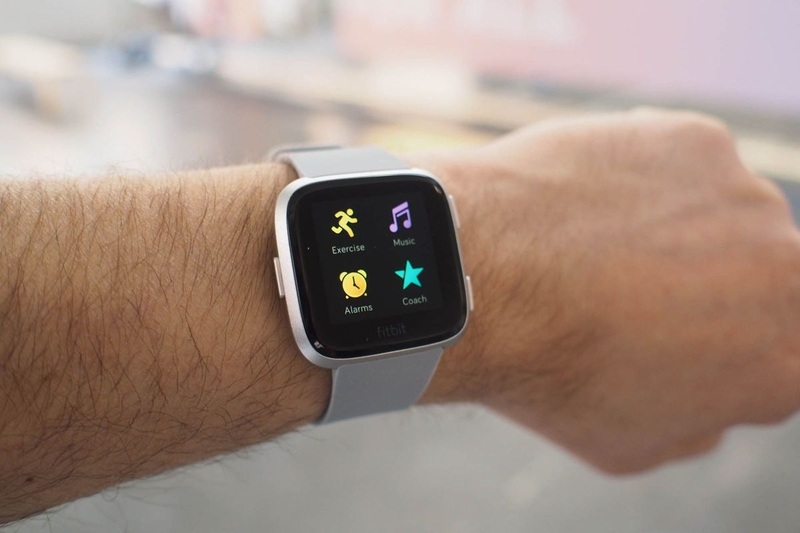 Fitbit uses a proprietary operating system developed from its recent Pebble acquisition and to this end, the Versa has the latest version called Fitbit OS 2.0. It’s smooth, generally responsive and very battery friendly compared to the likes of Wear OS, Tizen or Apple’s Watch OS. Swiping from the left-hand side brings up installed apps. There’s not a huge number to choose from, but there is support for Philips Hue smart lights, Deezer, Starbucks and so on. Sporty types will also appreciate built-in coaches, which allow the wearer to select running, swimming, biking, weights, interval training, the treadmill, or a full body workout. More options can be loaded onto the Versa via the Fitbit app, and there are 19 workouts to choose from. I’m still waiting for a pub pint tracking app that covers events such as litres of strong ale consumed, chip packets opened, steps to the bathroom and so on. I live in hope. One area where Fitbit has kept up its lead is water resistance. Very few smartwatches can take a dunking and keep working. The Versa even comes with a swimming coach and is fine for immersion in up to 50 metres of water for 30 minutes. Another bonus with the Versa is that it comes with 4GB of storage, 2.5GB of which is available for music. While that might sound puny, its ample tunage for a short run. This means you can pair the Versa with Bluetooth cans and run with no phone/music player. The catch there is that if you need to track your run using GPS, the Versa lacks the built in GPS of the Ionic, which means you will need your phone after all. That said, adding music is also about as much fun as putting your nuts in a vice thanks to the Fitbit PC app. There is, however, both Pandora and Deezer built in, but again you’ll need your phone to stream. A bonus is that Fitbit offers a one-month free trial of Pandora and a three-month trial for Deezer with the Versa. Another reason for owning a smartwatch for me is being able to discreetly check phone notifications on my wrist. Glancing at a phone in a meeting or presentation is considered poor form, but it is significantly easier to sneak a discrete peek at one’s watch. Sometimes you don’t even need to look as the Versa vibrates whenever a phone app posts a notification. Equally handy is the ability to answer or decline incoming calls straight from my wrist. The killer feature with the Versa is easily battery life. Unlike Tizen Apple Watch OS and Wear OS smartwatches, the Versa doesn’t need to be charged every night. Off a single charge I was able to wring four days of battery life out of the Versa. All told, the Fitbit Versa ticks a lot of boxes. For a start, it’s comfy to wear and it looks good. Then there’s its water proofness and four days of battery life. This is not too shabby at all considering its very reasonable $349.99 sticker price.